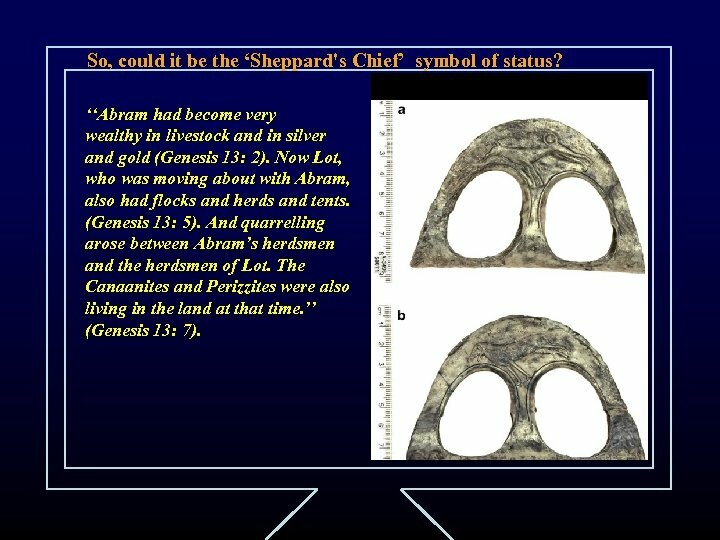 So, could it be the ‘Sheppard's Chief’ symbol of status? 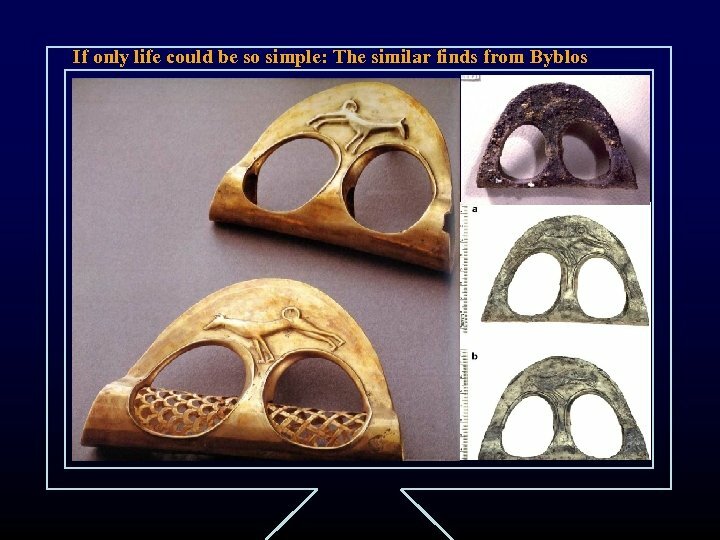 ‘‘Abram had become very wealthy in livestock and in silver and gold (Genesis 13: 2). 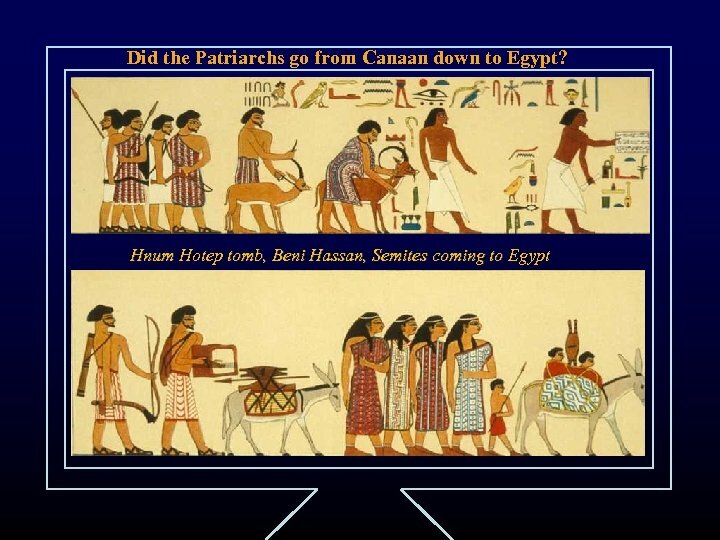 Now Lot, who was moving about with Abram, also had flocks and herds and tents. 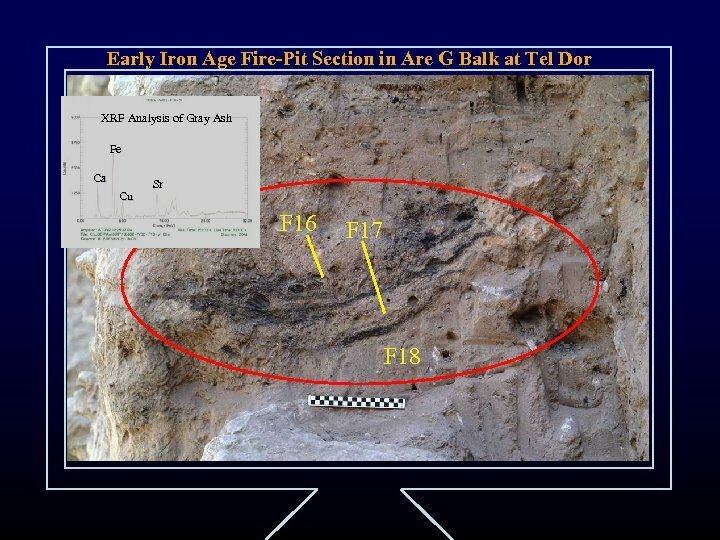 (Genesis 13: 5). 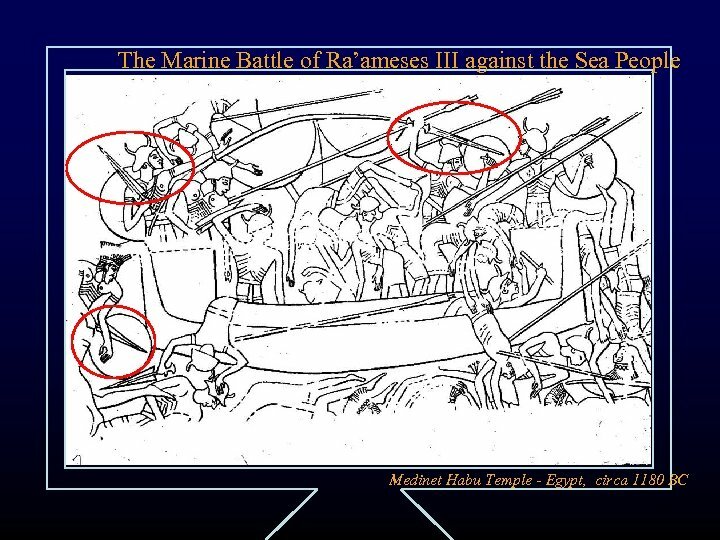 And quarrelling arose between Abram’s herdsmen and the herdsmen of Lot. 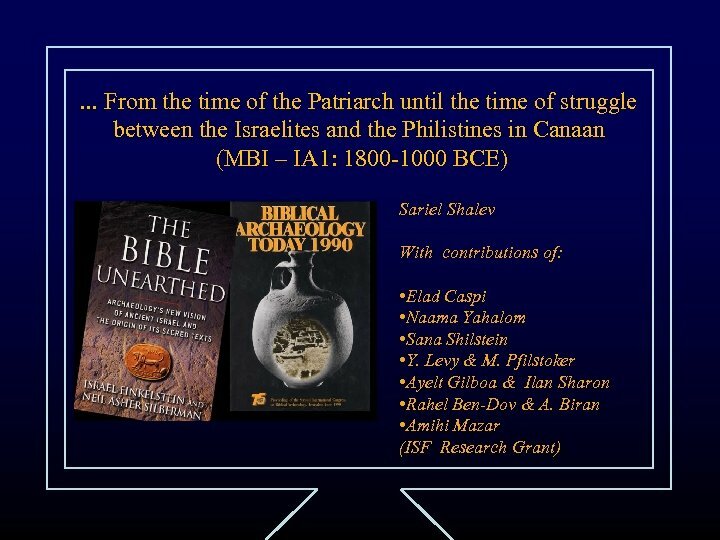 The Canaanites and Perizzites were also living in the land at that time. 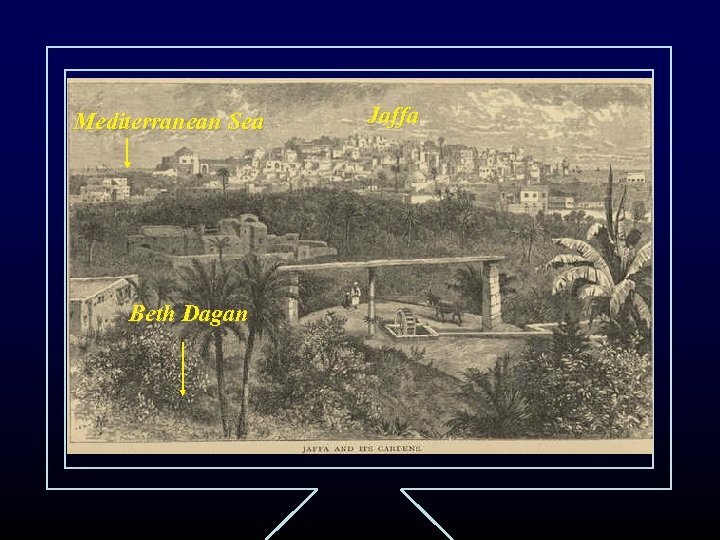 ’’ (Genesis 13: 7). 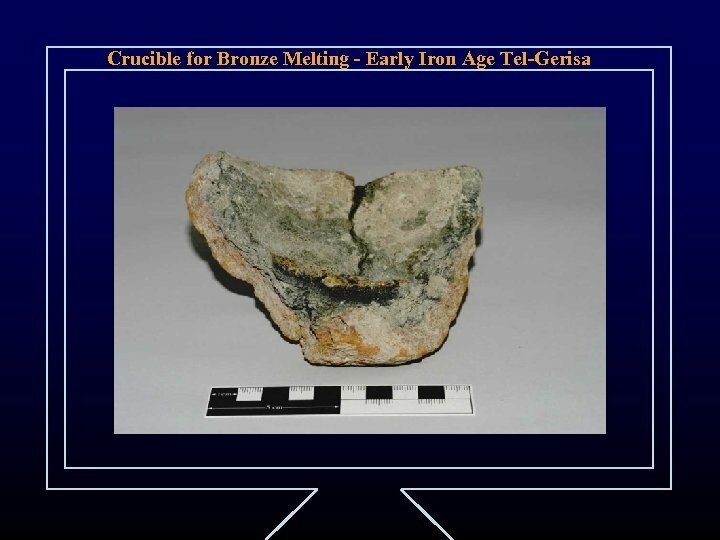 What could we add to the known material and metallurgy? 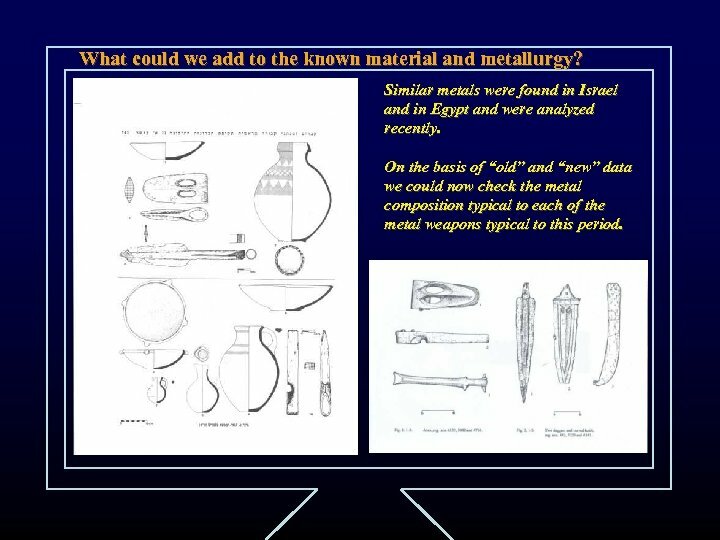 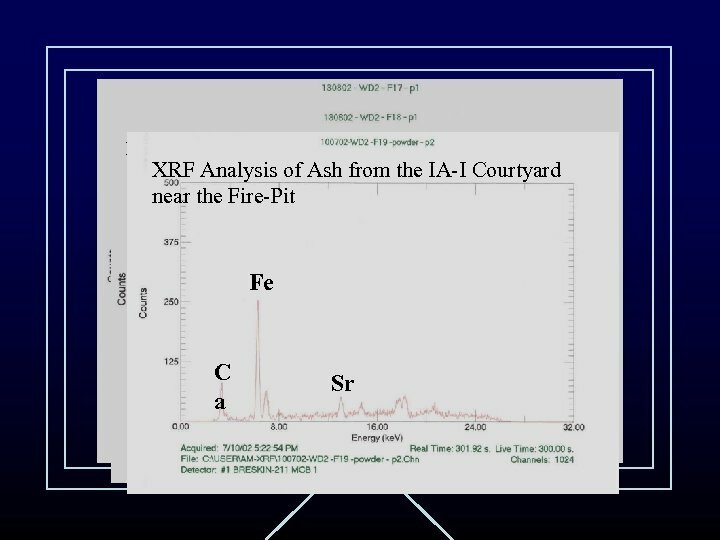 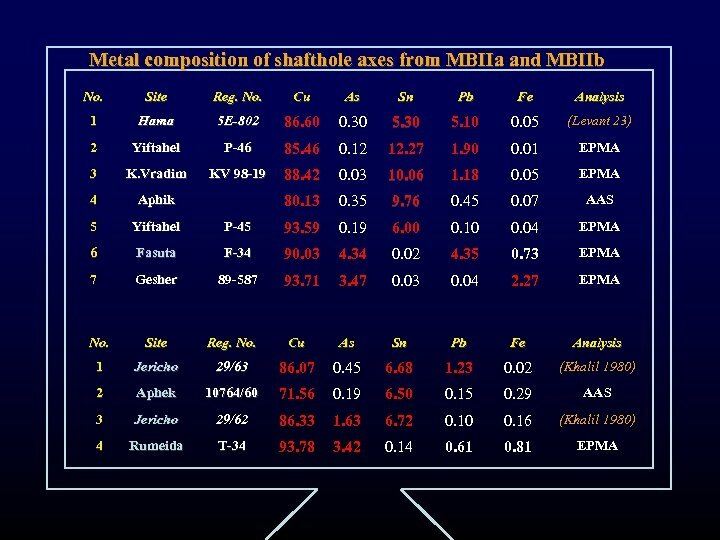 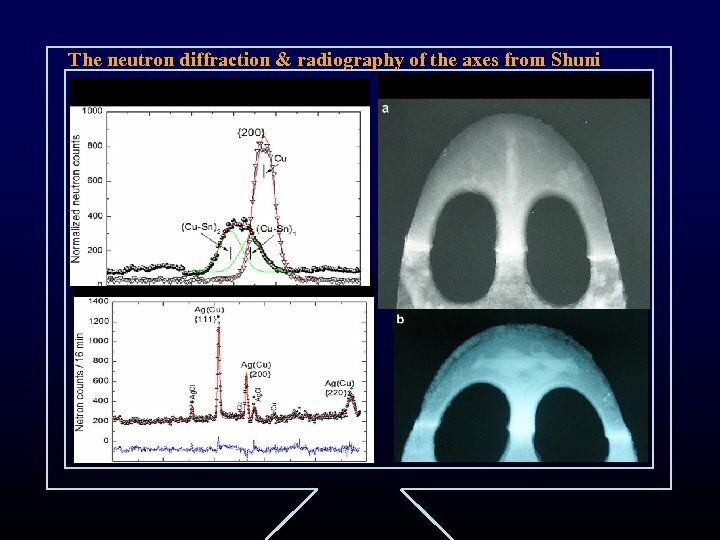 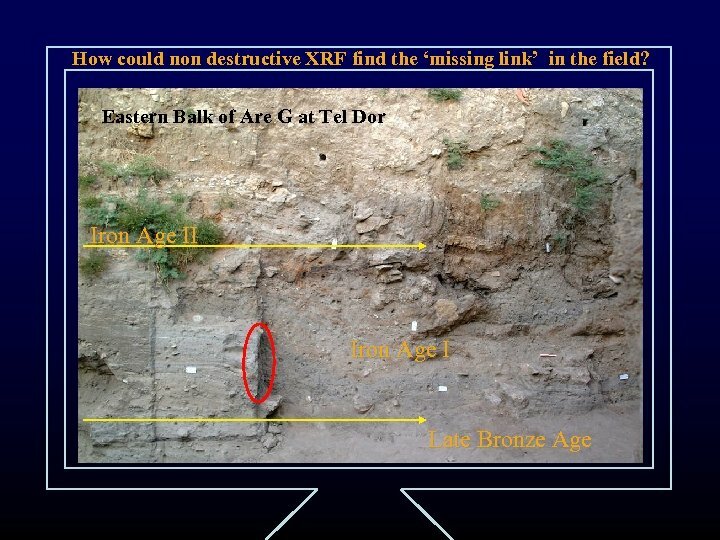 Similar metals were found in Israel and in Egypt and were analyzed recently. 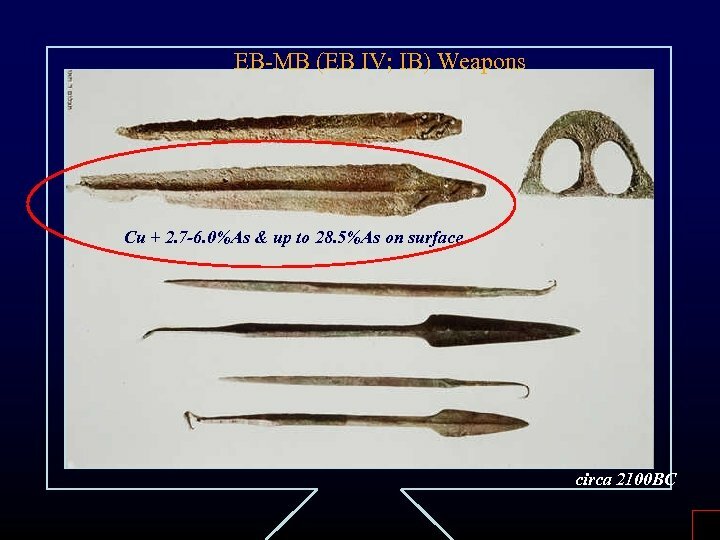 On the basis of “old” and “new” data we could now check the metal composition typical to each of the metal weapons typical to this period. 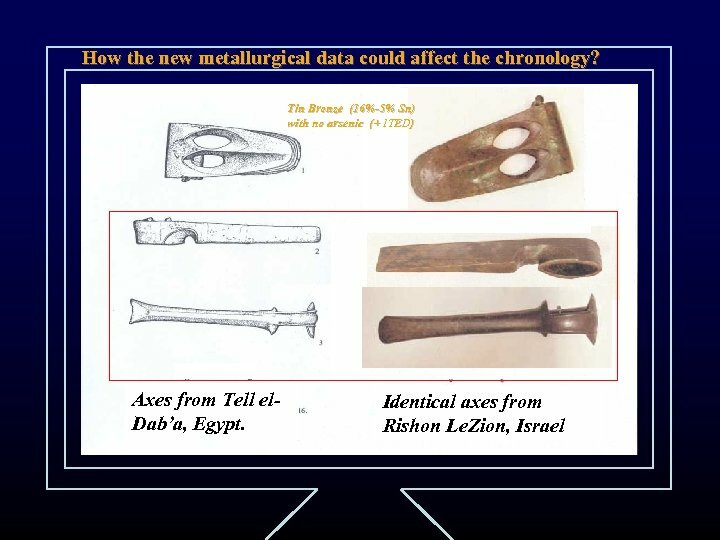 The Middle Bronze Age metal artifacts: what do we already know? 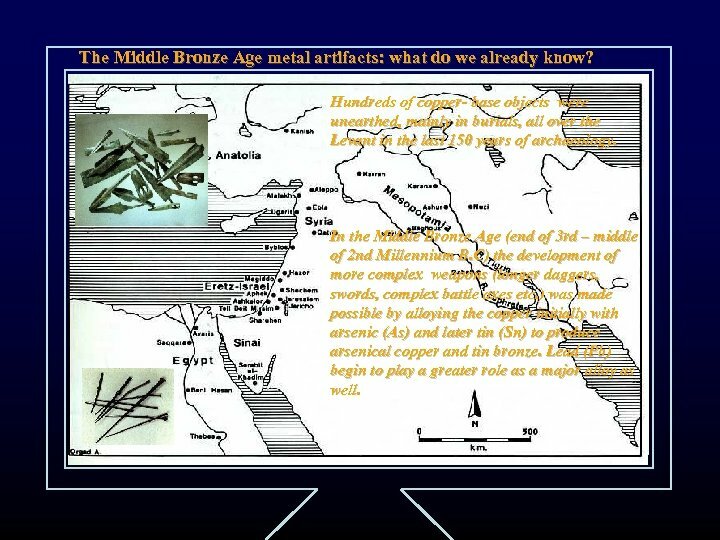 Hundreds of copper- base objects were unearthed, mainly in burials, all over the Levant in the last 150 years of archaeology. 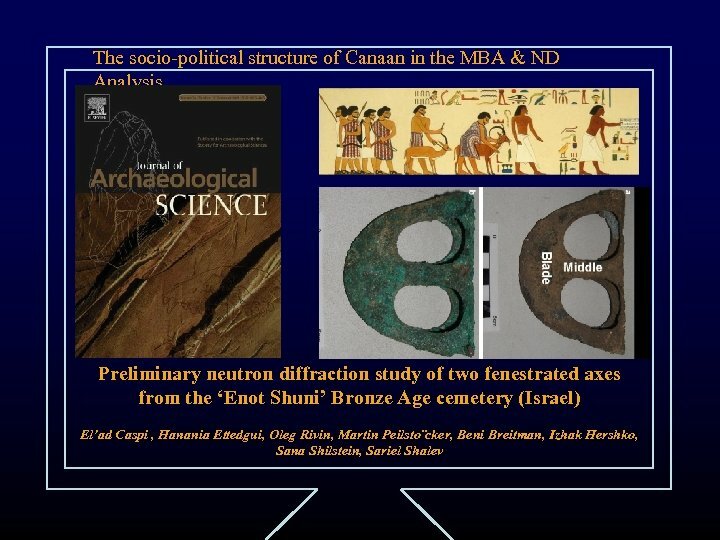 In the Middle Bronze Age (end of 3 rd – middle of 2 nd Millennium B. 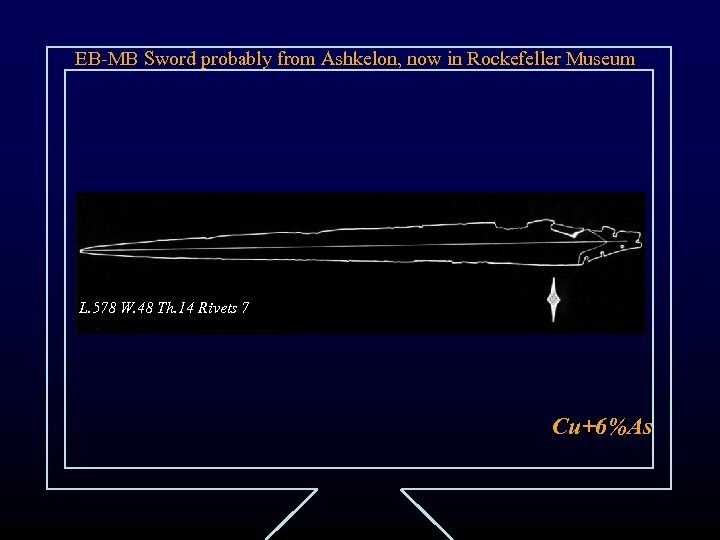 C) the development of more complex weapons (longer daggers, swords, complex battle axes etc. ) 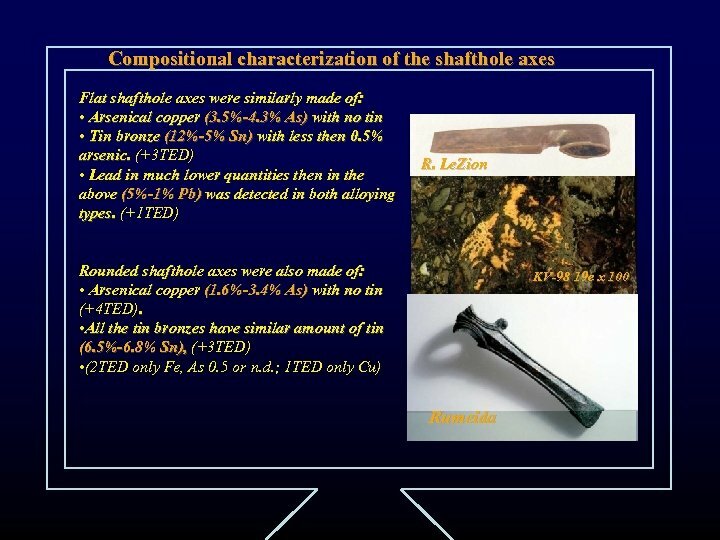 was made possible by alloying the copper initially with arsenic (As) and later tin (Sn) to produce arsenical copper and tin bronze. 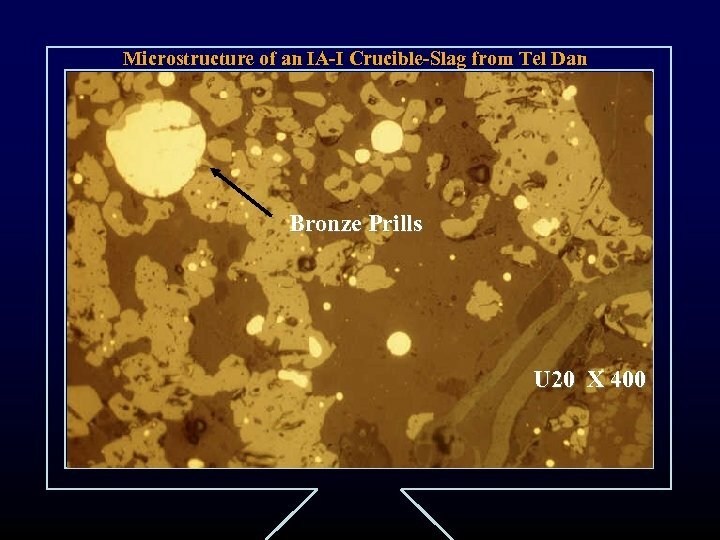 Lead (Pb) begin to play a greater role as a major alloy as well. 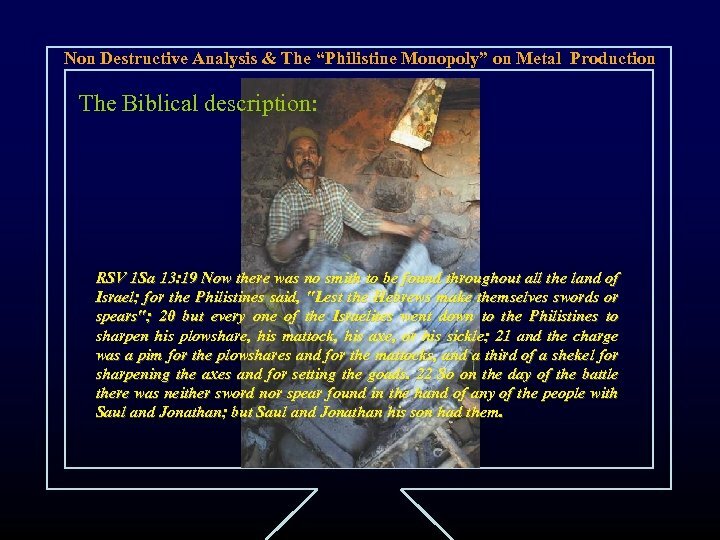 Non Destructive Analysis & The “Philistine Monopoly” on Metal Production The Biblical description: RSV 1 Sa 13: 19 Now there was no smith to be found throughout all the land of Israel; for the Philistines said, "Lest the Hebrews make themselves swords or spears"; 20 but every one of the Israelites went down to the Philistines to sharpen his plowshare, his mattock, his axe, or his sickle; 21 and the charge was a pim for the plowshares and for the mattocks, and a third of a shekel for sharpening the axes and for setting the goads. 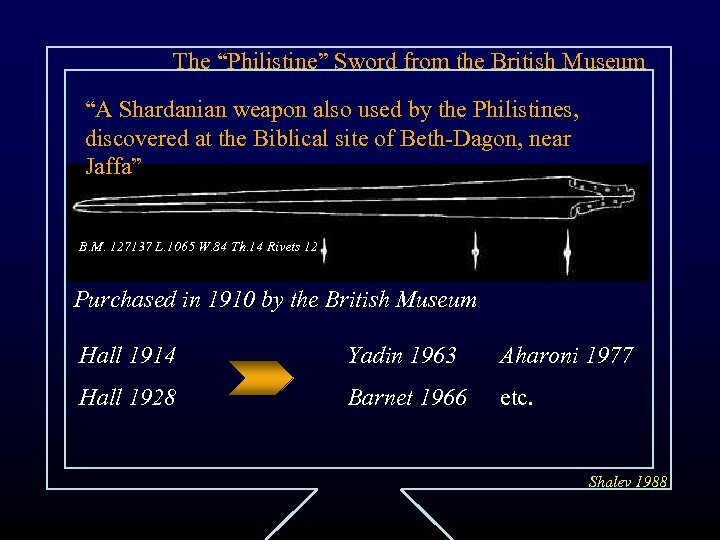 22 So on the day of the battle there was neither sword nor spear found in the hand of any of the people with Saul and Jonathan; but Saul and Jonathan his son had them. 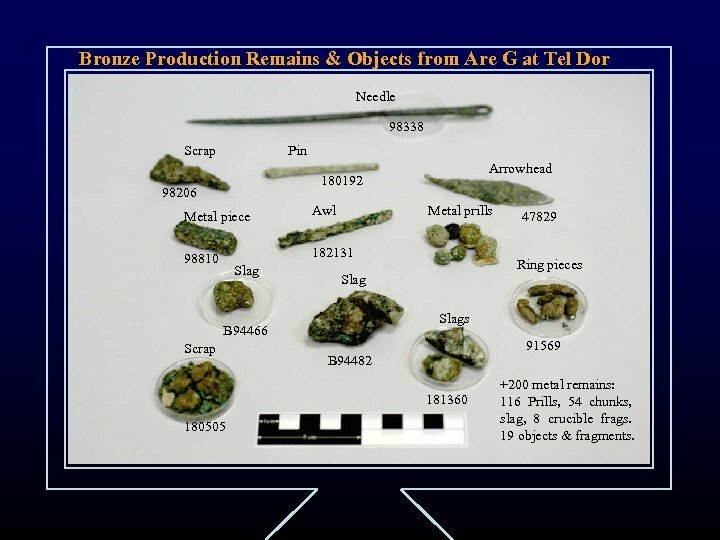 Bronze Production Remains & Objects from Are G at Tel Dor Needle 98338 Scrap Pin Arrowhead 180192 98206 Metal piece Awl 98810 182131 Slag Metal prills Ring pieces Slags B 94466 Scrap 91569 B 94482 181360 180505 47829 +200 metal remains: 116 Prills, 54 chunks, slag, 8 crucible frags. 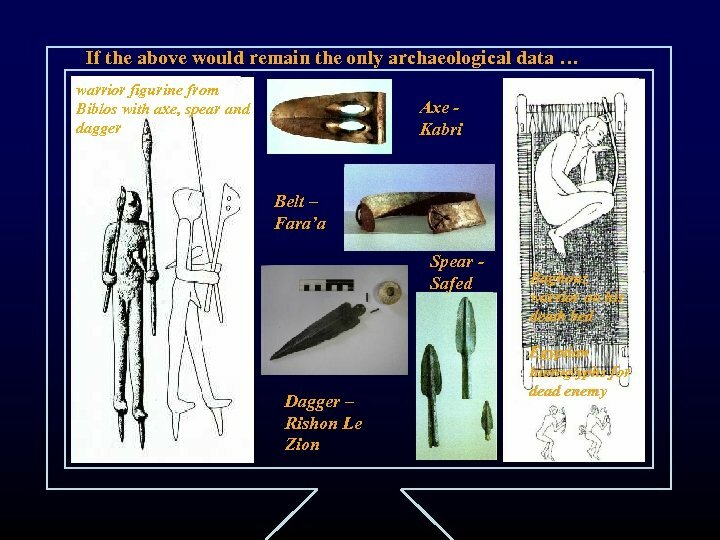 19 objects & fragments. 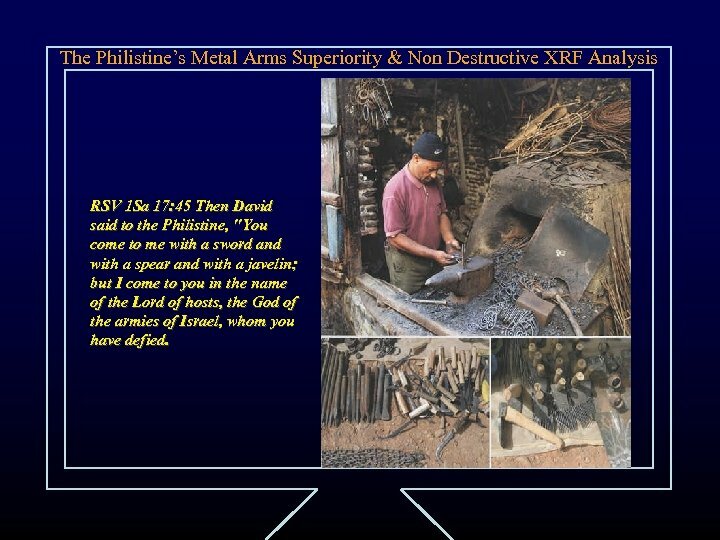 The Philistine’s Metal Arms Superiority & Non Destructive XRF Analysis RSV 1 Sa 17: 45 Then David said to the Philistine, "You come to me with a sword and with a spear and with a javelin; but I come to you in the name of the Lord of hosts, the God of the armies of Israel, whom you have defied. 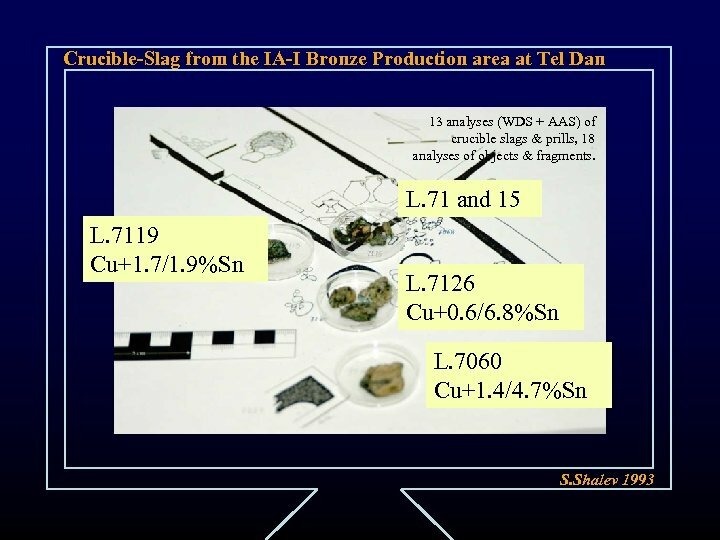 So – what do we know better about IA-I Metallurgy? 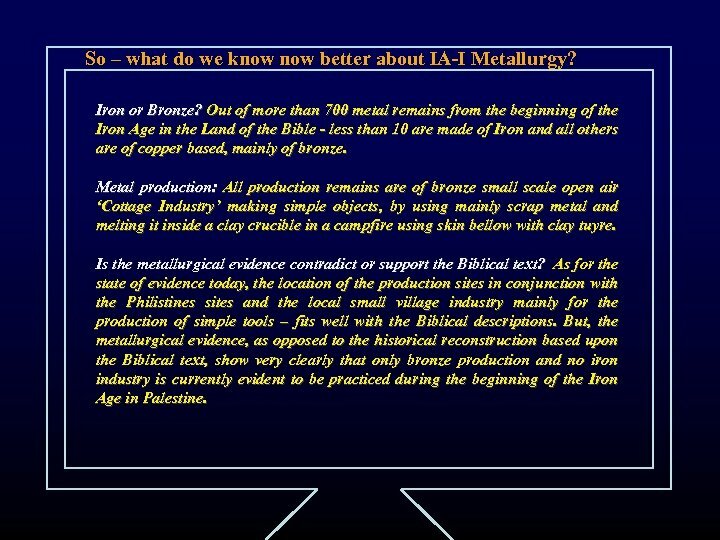 Iron or Bronze? 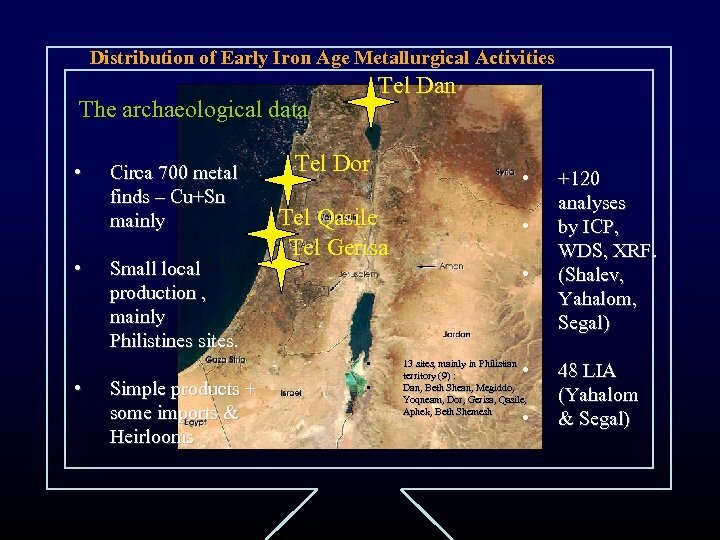 Out of more than 700 metal remains from the beginning of the Iron Age in the Land of the Bible - less than 10 are made of Iron and all others are of copper based, mainly of bronze. 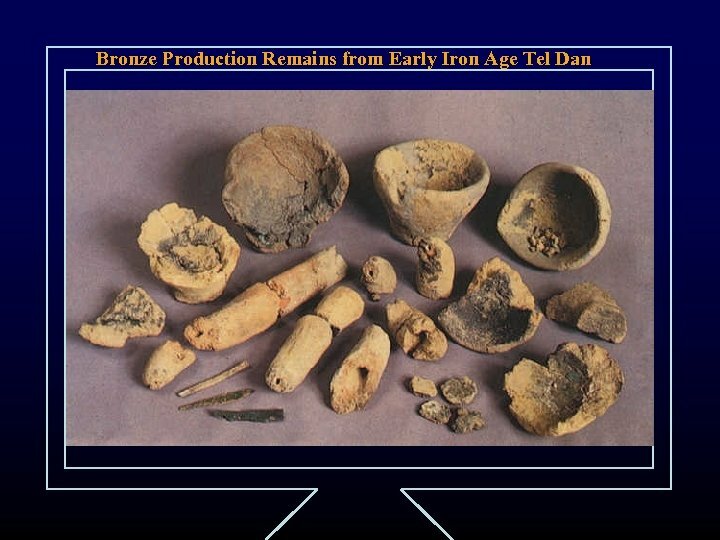 Metal production: All production remains are of bronze small scale open air ‘Cottage Industry’ making simple objects, by using mainly scrap metal and melting it inside a clay crucible in a campfire using skin bellow with clay tuyre. 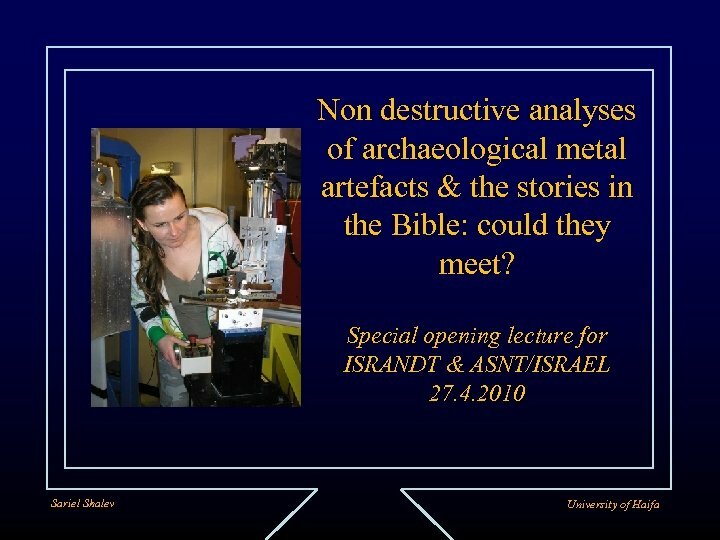 Is the metallurgical evidence contradict or support the Biblical text? 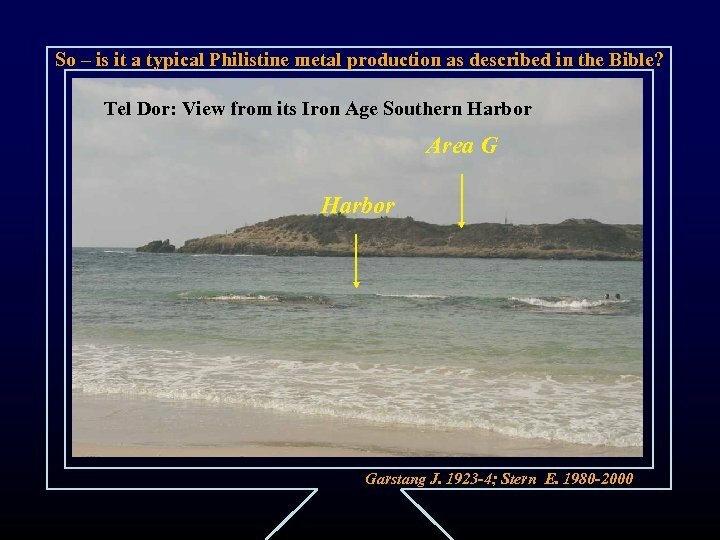 As for the state of evidence today, the location of the production sites in conjunction with the Philistines sites and the local small village industry mainly for the production of simple tools – fits well with the Biblical descriptions. 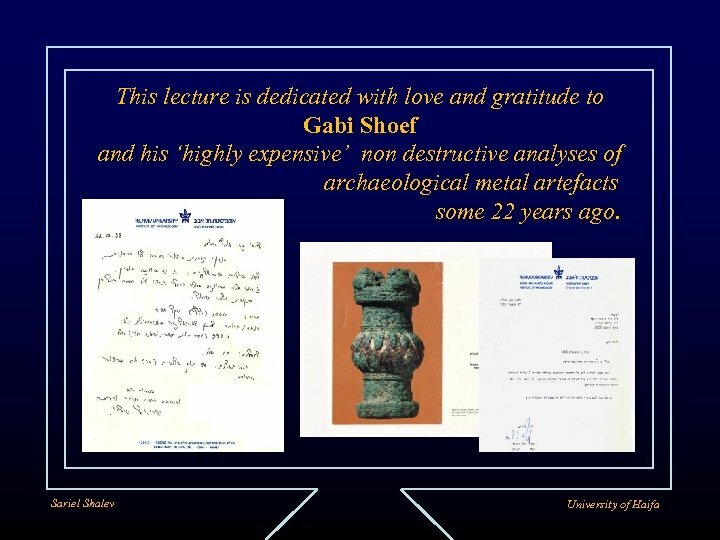 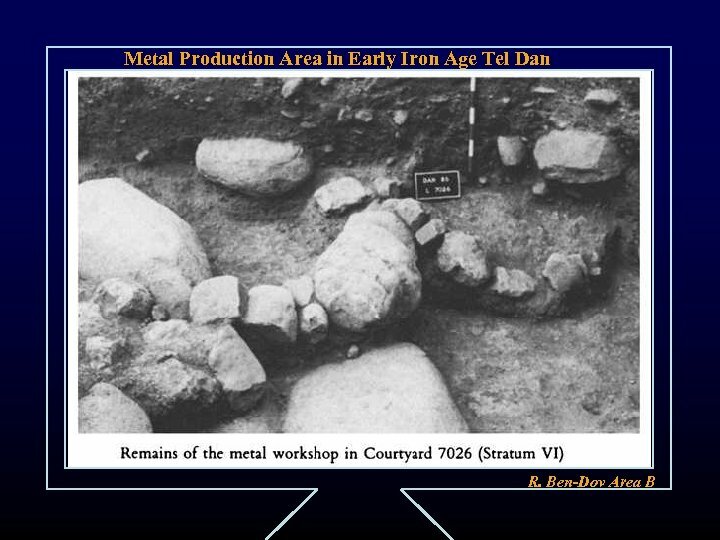 But, the metallurgical evidence, as opposed to the historical reconstruction based upon the Biblical text, show very clearly that only bronze production and no iron industry is currently evident to be practiced during the beginning of the Iron Age in Palestine. 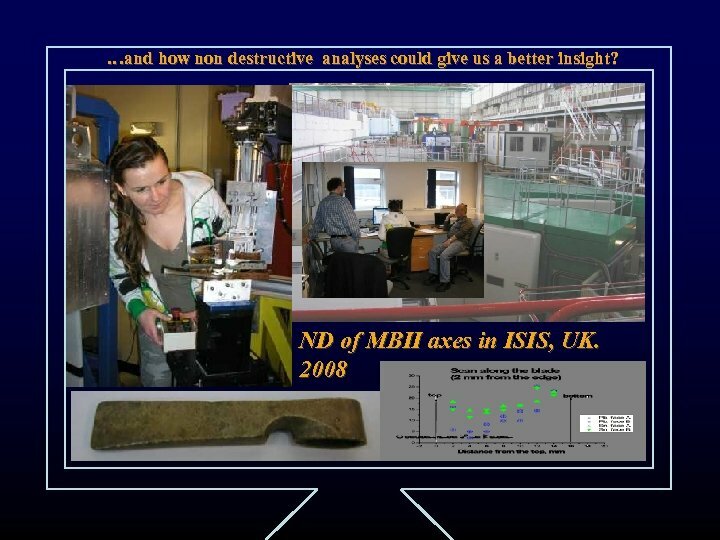 Metal-Insulator-Semiconductor and Metal-Insulator-Metal Structures. 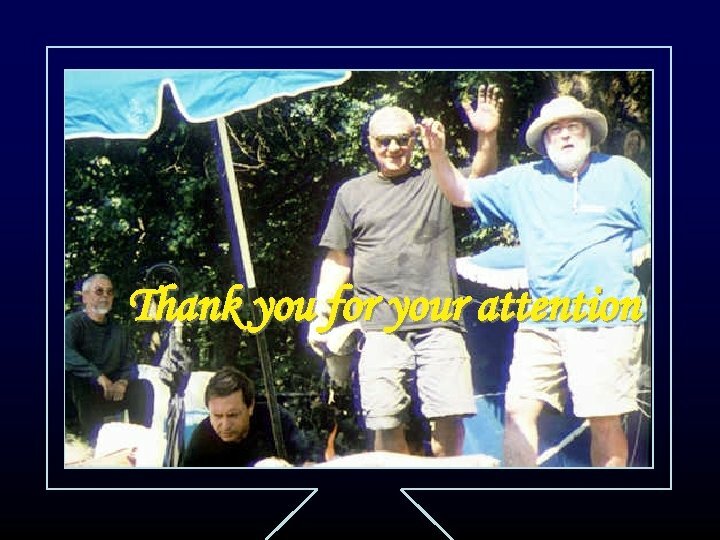 Part III.